If you are a BBQ newbie considering the purchase of a cheap offset smoker, or are about to use it for the first time, read this whole page and be sure to carefully read my article about Cheap Offset Smokers. 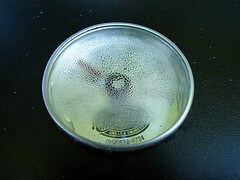 Lid thermometers are notoriously inaccurate due to poor calibration, and the installation location. Also, they often fill with condensation. Understanding and controlling the cooking environment is necessary for fantastic meat. Controlling your heat source is crucial. When is comes to temp, don’t rely on the thermometer in the lid of your cooker. They are notoriously inaccurate. Even when calibrated, they do not accurately measure the temp at the level where your meat will be cooking and they often fill with humidity (at right) preventing one from reading the temp! At the very least, invest in an inexpensive oven thermometer placed directly on the cooking grate. A good alternative is to purchase a pair of quality pit thermometers and mount them in the lid of your cooker a just above the grate level. These are typically $15 to $50 and installation is usually a cinch with a drill, bit, and center-punch. Many of these can be calibrated (boiling water method) and when mounted just above the grate, they offer a much more accurate temp reading where it matters most. It is a good idea to mount one on the left and one on the right of a horizontal cooking chamber to indicate the temperature variation along the length of the cooker (below). Dual thermometers just above the cooking level. Dual calibrated thermometers mounted just above the cooking grates give a more accurate temperature reading. Note the height of the original thermometer. Better yet, get a digital thermometer* with more than one remote probe; one probe can measure the temp at grate level, the other can give you accurate internal temp of your meat. Note that these probes cannot tolerate the very high temps of searing/grilling but are great for smoking and BBQ at medium and low temperatures. For a newcomer to the world of BBQ, or for the experienced pit-master with a new cooker, it is well worth the time and effort to experiment a little and learn how to accurately control temperature before you cook your meat. A gas grill can easily be regulated with the grill’s controls, not by regulating air vents. Before cooking meat, get familiar with the range of temperatures your grill is capable of producing, from the very lowest to the hottest. Keep in mind that a grill is not really designed for the low temperature cooking of barbecuing (some people distinguish between low-temp barbecuing and high-temp grilling) so the question becomes how low can your grill go? If you plan on smoking large cuts of meat, find the temperature your grill can maintain by using only one burner on low. When smoking large cuts, you ideally need to maintain a temperature of 210° – 225° Fahrenheit inside the cooking chamber. Of course, ambient weather and temperature will have some effects on the temperature inside the cooker. If your grill runs a little hot at it’s lowest setting, but you can keep it around 250° Fahrenheit, then I wouldn’t stress. At that temp you could cook some fantastic ribs, and I wouldn’t hesitate to cook small cuts of pork shoulder for astounding pulled pork. To regulate temp of your charcoal cooker, you must regulate the amount of oxygen provided to the burning charcoal. These cookers usually have two vents: one lower and one upper. 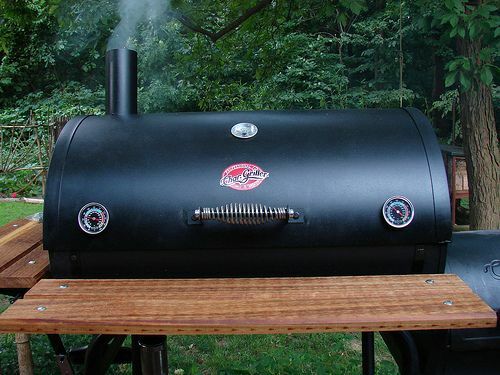 For charcoal grills, the upper vent is usually in the lid. Many smokers have an upper vent at the exit point of the chimney. Start with the upper vent all the way open. For the lower vent, start with it open at about half way. If more heat is needed, open the lower vent. To cool, close the lower vent down a bit. Fine tuning of temps can be done by opening and closing the upper vent. Before adjusting the upper vent, regulate the lower vent first. Only adjust one vent at a time! The inability to accurately regulate air flow due to leaks can pose a real problem in your cook. This is very relevant to cheap offset smokers. You should be aware that opening the cooking chamber can cause a dramatic drop in temp (and loss of humidity) if your cooker is not made of heavy steel so keep the lid closed as much as possible. Temps will also drop as charcoal is depleted. You should start with a good amount of lit charcoal and limit the air intake with the lower vent to maintain a long, slow burn. Position your pit in a safe location that is also sheltered from the prevailing breeze. Spend some time modifying your cooking chamber to safely seal up leaks. To find the leaks, get a chimney of charcoal going and dump it in the firebox, make sure both chimney and intake vents are open, throw a chunk of dry wood on the coals and wait for smoke. The vast majority of smoke should come from the chimney. Check these areas for leaking smoke:- The seam around the cooker lid. – Extraneous bolt holes pre-drilled my the manufacturer for accessories you’ve not installed. – The seam around the firebox lid. – The seam where the firebox joins the cooker. Keep the lids to your cooker and firebox closed as much possible. A common mantra in the BBQ world is “If your lookin’, it aint cookin!” This is because every time you open a lid, the heat and humidity quickly escapes. Inexpensive offset smokers are made of lightweight steel and they lack the mass (and price tag!) of a cooker made of 1/4″-steel. Larger and heavier cookers are able to more easily and quickly recover temp. The last point raises the question: how do you keep tabs on the temperature in your cooker if can’t trust the lid thermometers and should keep the lid closed as much as possible? The answer is pretty simple. You spend a little money and get yourself a decent remote wireless thermometer. You can be sitting in the AC drinking a cold brew (preferably your own homebrew!) while you monitor the exact temp of your Boston But smoking out on the deck! A decent remote thermometer is worth its weight in gold and it will pay for itself in improved results, saved meat, and prevented frustrations. If you are interested, you can make some simple modifications to tune your cheap offset smoker to even out temperatures inside of the cooking chamber. Modifications beyond the simplest will take a little workshop know-how, some research, tools, time and materials. Look for a modification article from me in the future. At What Temperature Should I Maintain My Pit or Smoker? Lean cuts of meat are often cooked at higher temperatures. Chicken breasts are often cooked around 350° Fahrenheit while thick steaks may go on a grill heated to over 550° Fahrenheit. 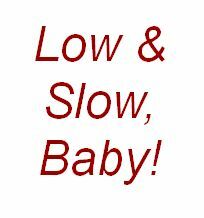 Though not low and slow, this process works its own magic. These high temps sear the exterior surface. This caramelizes sugars on the surface and some say seals in the moisture of meat to help maintain juiciness. In all cases, make sure that the minimum safe temperature has been reached in the thickest part of the meat. 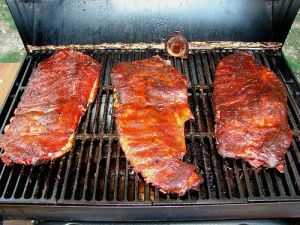 This entry was posted in How-To Guides, Smoking & BBQ 101 and tagged backyard, BBQ, charcoal, control, cooker, cooking, COS, food, fundamentals, gas, grill, offset smoker, outdoor, pit, propane, regulate, smoker, Smoking & Barbecue 101, temperature, thermometer. Bookmark the permalink.